Whilst dowsing and surveying stone circles on Dartmoor, Devon and later at Boscawen-un, Cornwall, we have been very aware of a movement of energy that seems to be present at the centre of these stone circles and which slowly swirled in an anti-clockwise direction. This we feel is the result of energy (radon gas), absorbed by water reaching the surface from the depths of the strata, lifted upwards by the natural heat from lower levels. This mixture of water vapour and decayed uranium has been found in mines and in the sub-basements of build­ings in zones where the granite sub rocks predomi­nate. It is logical to understand that such rising energy, would through the natural movement of the planet (anti- clockwise rotation), assume a swirl or twisting semblance. We have observed this effect in all of our dowsing surveys both in Devon and in Cornwall. The writer had always been able to follow the energy swirl in a dowsing mode, and has found, by flagging this effect, an anti-clockwise spiral is illustrated within the confines of the stone circles. The movement of the swirl in its progress outwards from the centre to the perimeter of the stone circle is typically 3½revolutions. 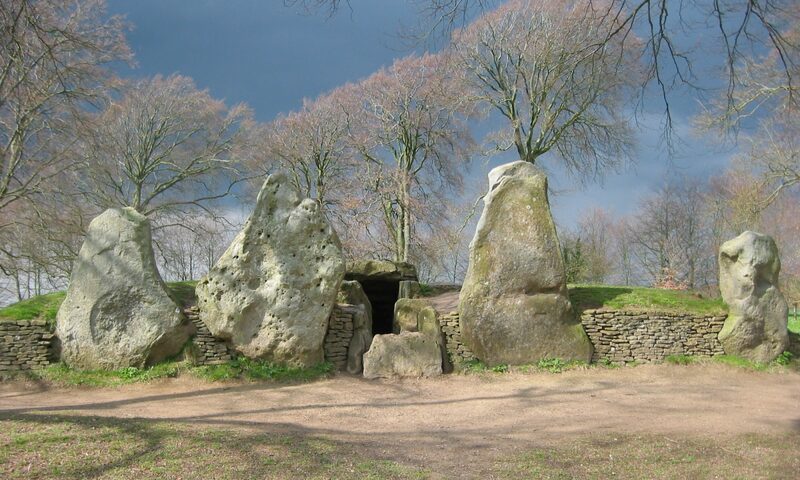 To date, we have interpreted this natural process as being confined to our local area, although its emergence at our dowsing and surveying at Boscawen-un, Cornwall, has led us to broaden our area, in an assumption that this effect will probably apply to areas where a granite sub strata exists world wide. Since the effect is most noticeably to us, involved in some of the constructions of the Bronze Age and is present today we might assume that the effect described has existed for many thousands of years. It is surprising however, to find that the effects listed above, were known and understood and seemingly used in the general area of the Middle East, certainly in the period around 1650 BC and in all probability it was known of many centuries or even millennium earlier. Whilst researching the Tholos of Marmaria, sited at Delphi, Greece, my attention was drawn to notes on the Phaistos Disc, which was found in 1908 AD by the Italian School of Archaeology in Athens, in the ruins of the royal apartments, on the site of the accumulated ruins of at least four palaces, which until the final destruction by fire and earthquake occurred in 1650 BC, at Phaistos, Iraklion, Crete. There are many published accounts as to the possible usage of this object but it seems no satisfactory answer has been proposed. In my opinion that since this is a pottery object, it must have been purchased at least in some number, and since it was found in the royal apartments, it was at least known to the members of the royal household at that time. It is also reasonable to assume that other persons would also have been aware of its existence and usage, at least in the context of the privileged few. The Phaistos Disc clearly represents a technique of pressing out or printing, employed in the pottery by the makers, in the moulding of the clay. This tech­nique it is understood was not widely used in Europe at that time, so perhaps this was experimental in nature. However, I was impressed by the clarity of design and the technique, which produced such by clear impression of the relief. My interest is however, in the picture or message that is conveyed to the observer. The relief is in fact arranged as a spiral. It starts at the centre and turns anti-clockwise through 3½revolutions, reaching the edge of the disc where the pattern exits the pathway, through an exit gate. The pictographs are seemingly close in their appearance to the pictographs/messages as used by the early Summerians in Babylon around 5000 BC. The earliest form of writing in fact. The interpretation that the writer reads in the message of the Disc is that of the mortal coil of life. The 3½ revolutions vindicate the life span of three score years and ten, as spoken of at length in the Holy Bible, and is in fact taken as to be of 70 years length. The mortal coil pictorial display, is a pictorial mes­sage of a person’s journey through these years and the situation that would arise during the journey. Starting at the centre, we see a representation of the Sun from where all life flows. The individual pro­gresses through life until at the end he leaves the mortal coil, to join his ancestors. It is curious that in Crete at some period before 1650 BC the reasoning! technology employed in the de­sign of the Phaistos Disc should appear to be in agreement with the swirl affect and transposition of energy, that we have found in Bronze Age ruins of stone circles in Britain, dating from 2000 BC. It would therefore seem to be a commonly held tradition and practice in both areas. We can only therefore presuppose, that there were many other commonly held practices and traditions and that they are yet to be re-discovered. The Phaistos Disc is in the keeping of the archaeological museum in Iraklion, Crete.